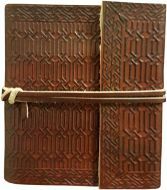 Journals and notebooks with embossed leather covers. Hand stitched designs contain cotton rag paper handmade from recycled cotton. The paper is hand-stitched into the cover using a patterned long stitch. 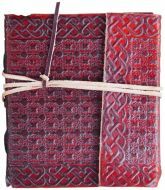 The embossed range features notebooks, journals, sketchbooks, refillable journals. The range of refillable notebooks have embossed leather pockets that hold standard sized notebooks (included with your order). The Notebook and Book of Shadows covers have a reinforced fabric lining for extra strength.